Fads come and fads go – pretty much by definition. Was it just 2017 that was the year of the Fidget Spinner? The fidget spinner of 1975 had to be the “Mood Ring”, which looked a bit like an large opal ring that changed color depending on your “mood.” Smoky colors meant you could be tense. Blue — you might be happy. It seemed magical. 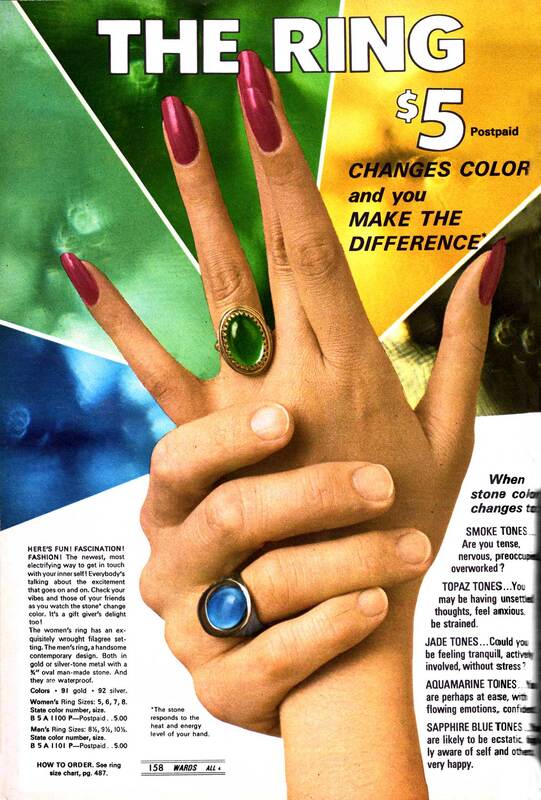 And at first, Mood Rings commanded a premium price – some versions were well over $100 when they were introduced. And then the masses got hold of them. By the spring of 1976 they were being sold at “Monkey Wards” for five dollars. The fad lasted a year or so. Mood rings were a hot jewelry item…until people discovered it was really just how hot your skin was that was being reflected in their color. The mood ring was basically a small liquid crystal thermometer. Or, perhaps people realized they could figure out if they were tense or happy without the aid of a ring. I believe I bought mine at my local Eckerd's drugstore for $2.95, towards the end of the fad. A bargain price, so I was happy — and my ring confirmed it! Even now they're available (along with everything else) on Amazon. 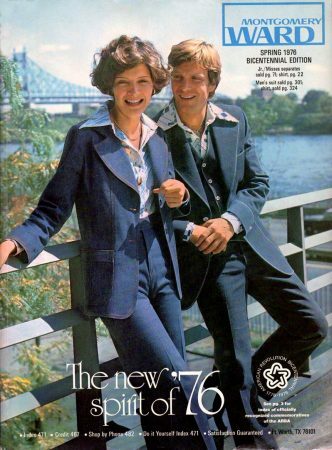 Oh, and another fad from 1976? His and Hers matching denim jumpsuits, as seen on the Montgomery Wards catalog cover.